Fruit cake recipes are not difficult to make but, they can be time-consuming. Christmas fruit cake is worth the trouble because, they're special-occasion cakes that are only made once a year. Only use the electric mixer to cream the butter or shortening with the sugar and when beating in the eggs. When blending in the fruits and nuts use a large bowl or kettle and mix by hand with a sturdy wooden spoon. When using candied fruits that are already chopped and mixed, use the same cup-for-cup measure and only use the light colored fruits in white fruit cakes. Don't chop your nuts for fruit cake in the food processor. Chop them with a knife so that the oils aren't released. Fruit cakes need to bake at a very low temperature-around 250 to 275 degrees; the depth and shape of the pan dictate the baking time. A one pound loaf will usually take two to three hours to bake, but a very large or deep pan will take longer. Line metal pans that are thin with a double thickness of wax paper to prevent overbrowning. Lay a sheet of foil or brown paper on top of the cake in the last part of baking to keep the top from getting too brown. You can steam fruit cakes in your crockpot by putting a rack in the bottom of the crockpot and filling it with about 4 cups of water (or up to the top of the rack). Start by boiling the water that you put in the crockpot and make sure it's still steaming when you put your cake in it. Put the crockpot on low. Cover the top of the pan your fruit cake is in with buttered wax paper and wrap the entire pan in double thickness foil. Put your cake pan in the crockpot on the rack and cover the crockpot. Steam on low for 6 to 7 hours; turn off the crockpot and let the cake sit in it with the cover on for another 2 hours before taking it out. Don't lift the lid on the crockpot while it's steaming, or you'll lose the heat and the steam. Click here to go to the Dark Fruit Cake Recipes Baking Chart-it has everything you need to know for making and baking dark fruit cakes. Click here to go to theWhite Fruit Cake Recipes Baking Chart-it has everything you need to know for making and baking white fruit cakes. Set a pan of water on the bottom of the oven; this keeps the top of the cake moist and gives it a shiny finish. 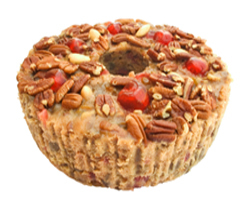 To test fruit cake for doneness, insert a toothpick in the center of the cake. If it comes out clean, the cake is done. Cool cakes in pans on wire racks; remove from pans when completely cooled. Dip layers of cheesecloth in fruit juice, wine, brandy or rum; remove the excess liquid by squeezing. Wrap fruit cakes in several layers of the wet cheesecloth and wrap each cheesecloth wrapped cake in foil that is sealed tightly. Store the fruit cakes in the fridge and re-moisten the cheesecloth once a week. To get the full flavor when using cheesecloth soaked with spirits, make the cakes about a month before using them. To store a fruit cake, put in a resealable bag or wrap tightly with plastic wrap and foil. This will keep in the fridge for about eight weeks. To store for a longer period of time, wrap tightly and freeze.